A youth drowned while taking a dip in the Sutlej along with his three friends this afternoon. The deceased had been identified as 20-year-old Mohammad Shahrukh, a resident of the Dharampura area near Baba Than Singh Chowk. The body was fished out this evening. Travelling by low-floor city bus service will cost more. Keeping In view the diminishing profits, the Ludhiana City Bus Service Ltd (LCBSL) has decided to increase the fares from next week. A leaking storm water pipe on Elevated Road has been causing inconvenience to commuters. Residents have to face the similar problem every rainy season. Shopkeepers said despite a number of requests, the MC had failed to tide over the problem. Thieves struck at a restaurant in posh Sarabha Nagar Market and decamped with Rs 50,000, a plasma TV and other valuables. The owner of the restaurant, Andad Kher, was shocked to see the premises ransacked this morning. The kingpin of the kidney racket, Perth Perteen Gahai, alias Baba, a resident of Assam, made nearly Rs 60 lakh in six months by duping residents. Baba was presented before a court today following a two-day police remand. The court extended his remand till June 19. The district health officer and the food safety officer, it seems, are in a confrontation mode. The former claims that the practice of collecting legal samples started after he joined as the district health officer in Ludhiana, but the latter belies his claims. The fund starved Ludhiana Improvement Trust (LIT) has failed to recover water and sewerage charges from residents. This despite the fact that the Punjab Water Supply and Sewerage Board has threatened the LIT to snap connections in several colonies due to the non-payment of maintenance charges. The LIT has also failed to check illegal water and sewerage connections. Migratory round of National Pulse Polio campaign kicked off today in the district. 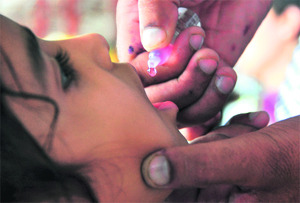 In this five-day long round, district health department has a target of administering polio drops to as many as 3,85,000 kids upto five years of age. The residents, shopkeepers and commuters of Sahnewal are residing under the shadow of death, as the electricity wires and meters installed in the low lying grain market are immersed in rain water. Though the farmers are upbeat over the heavy rains to sow the paddy crop, the increasing flow of water in Sutlej around Dhusi Bandh has caused the havoc of floods in the minds of the area residents. A heavy rain in the region during the last few days has evoked mixed reactions from the farming community. 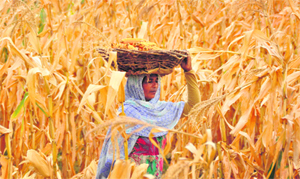 On one side, the rain has provided a huge relief to a large number of farmers willing to sow paddy in their fields. But on the other side, it has caused heavy financial losses to some other farmers who were yet to reap their crops, other than rice. Following the directions of Civil Surgeon, Ludhiana, Dr Subash Batta, a four member team visited the tyre market near the local bus stand and found the tyres lying in open and on roof top were full of water. The local administration department has pulled up socks and swung into action, after the Ludhiana Deputy Commissioner issued the instructions to the officials of various departments, to prevent the outbreak of various kinds of water-borne diseases, during the rainy season, following two days of heavy rain. The city traffic police is doing all it can to enforce the traffic rules and improve the chaotic situation prevailed on the roads in most parts of the city. But at the same time, they are not doing anything to put their own house in order. The rupee’s fall against the dollar has cheered the city’s apparel exporters and cycle manufacturers. The rupee on Monday hit a record low of 58.16 against the dollar. Apparel exporters from Ludhiana have been in an upbeat mood over the rising consumer confidence in the US which is one of the major export destinations. If you are holidaying abroad this summer, brace for greater expenses. The rupee's free fall has led to an increase of 5 to 10 per cent in tour packages. As a result people are preferring closer destinations to spend their vacation. A major chunk of the money invested by industrialists is lying with the excise and taxation department in the form of VAT refunds. Although the government claims to make the department paperless, it seems to be a distant dream. The police today carried out an anti-snatching drive. All SHOs were told to lay nakas in their respective areas. 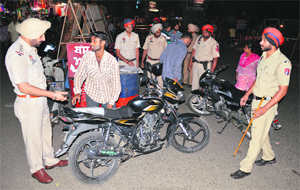 Youths riding two-wheelers were also stopped for checking. Those, who failed to produce documents, were seen making the policemen talk to some senior police officer or politician for evading challan. Artspace, an exhibition, was organised at Gallery Artmosphere today. Organised by city-based artist Ayushi Gupta, the event saw 26 artists showcasing their work. "I wanted to prove that there is no dearth of talent in the city," said Ayushi. With the changing times, the role and involvement of a father has undergone a change. Earlier, the role of a father was much more defined,” said Dr Sukhdev Singh, professor, sociology, PAU. The recently announced Amritsar-Delhi-Kolkata Industrial Corridor (ADKIC) has brightened the industry's hopes of development in Punjab. The local industry wants that the proposal should be turned into a reality. To inculcate the basic qualities of discipline, punctuality, leadership and self-confidence, a 10-day Combined Annual Training Camp is being organised by 3PB Girls BN NCC Ludhiana at GHG Khalsa College, under the command of Camp Commandant Col Ashwani Kumar. The fourth day of the camp was full of enthusiasm and information. The Division No 7 police has nabbed three thieves who had allegedly struck at a house in Sector 32 on June 14. The accused have been identified as Amit, Sukhdev and Sunny.